Perennial, ground cover or low shrub with erect or trailing woody stems, 5–30 cm long. 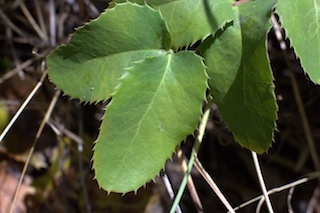 Thin, unbranched stems with alternate leaves composed of 5–7 (sometimes 3–9) paired leaflets. Oval- to egg-shaped leaflets, 1–8 cm long, have wavy margins with small, spiny teeth; which gives the leaflets a holly-like appearance. Leaflets are dull or glossy green on the top surface and dull, waxy-coated on the underside. Evergreen leaflets often turn red or purple in winter. Numerous yellow flowers on short stalks in dense clusters, 3–8 cm long, on stem tips. Flowers have 6 pollen-producing stamens, 6 two-lobed petals, 3 large inner sepals, and 3 outer bract-like sepals below petals. Bud scales in the flower cluster are less than 1 mm long and fall off soon after flowering. Sweet, fruity aroma. 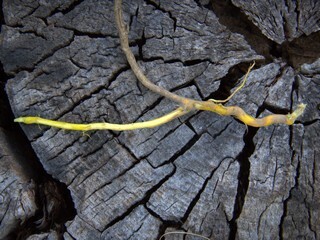 Rhizomes with bright yellow inner bark due to the presence of berberine, a bitter alkaloid. 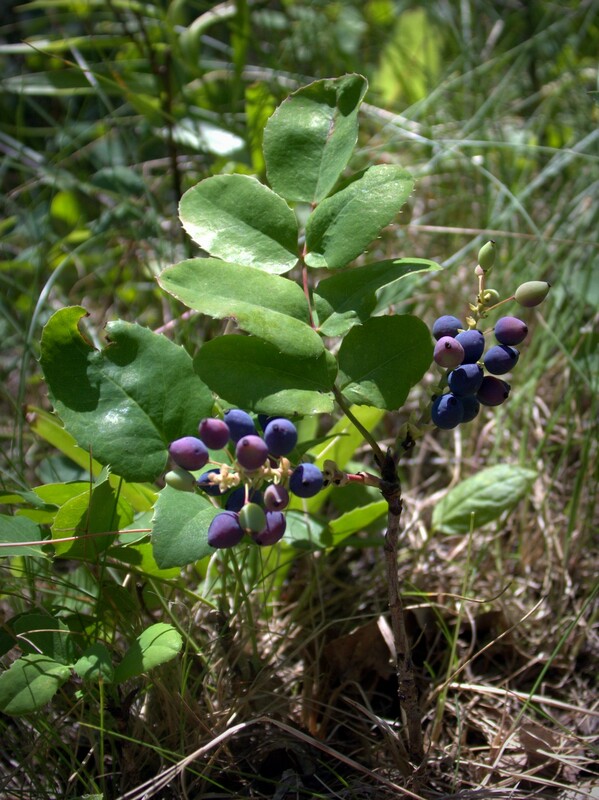 Edible but extremely sour, juicy, purplish-blue berries in grape-like clusters. 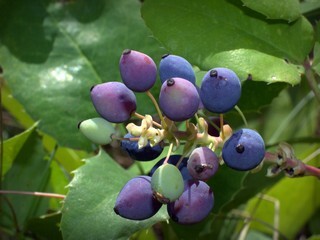 Berries have a waxy coating and contain few large seeds. Berries sweeten somewhat after a frost or two. Dry to moist, shady forests and brushy slopes. Often abundant under mixed conifers in low to mid-elevations. One of our region’s most important medicinal herbs. The root bark is used as an antiseptic/antibacterial, to treat PMS and kidney ailments, and to stimulate digestion and liver cleansing. The Blackfoot people used the root bark as a yellow dye and as a treatment for dysentery. The vitamin C rich berries are eaten by black bears (Ursus americanus) and make good jelly, jam, and wine when combined with an equal amount of sugar. The pollen-producing stamens snap inward when touched to shake their pollen onto bees.